Retired U.S. Army captain William Reynolds was happy to be alive when he woke up post-surgery after the improvised explosive device blew up, mangling his left leg and sending shrapnel into his arm. The rest of Reynolds’ life, and the quest to rebuild the athlete within him, had begun. A former baseball player and track athlete in high school, Reynolds became a collegiate gymnast at West Point, where he graduated in 2002. Two years later, the infantry officer was deployed to Southwest Baghdad. On Nov. 7, 2004, he found himself on a dismounted patrol responding to contact when an IED was remote-detonated. A lieutenant riding alongside him lost a leg at the hip while the gunner in Reynolds’ vehicle took some shrapnel to the abdomen and was able to return to duty about a week later. Reynolds didn’t consider himself fully healed until the leg was amputated nearly a decade later in September 2013. 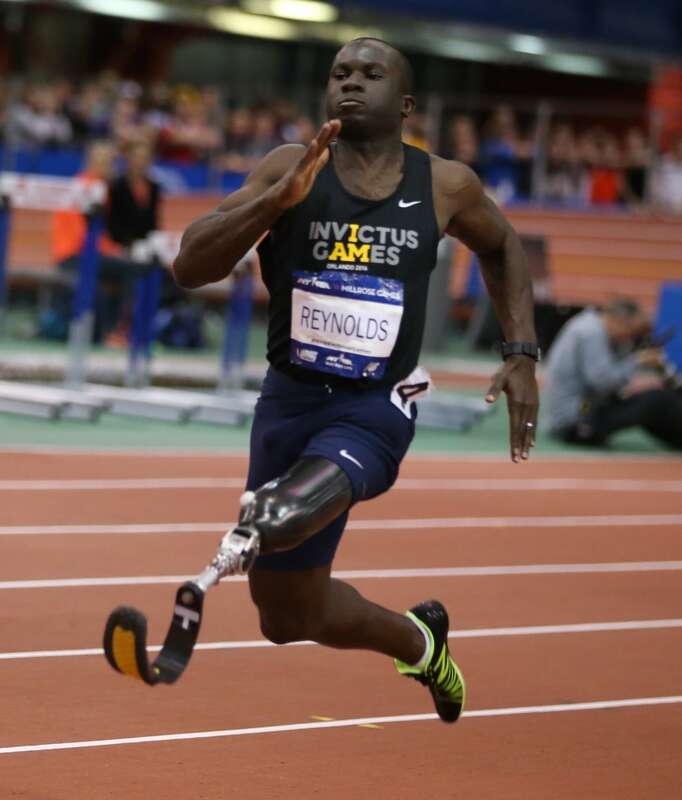 Now two-and-a-half years after that, Reynolds will serve as a captain for the United States’ 115-athlete contingent at the 2016 Invictus Games in Orlando, Florida, which get underway on Sunday. 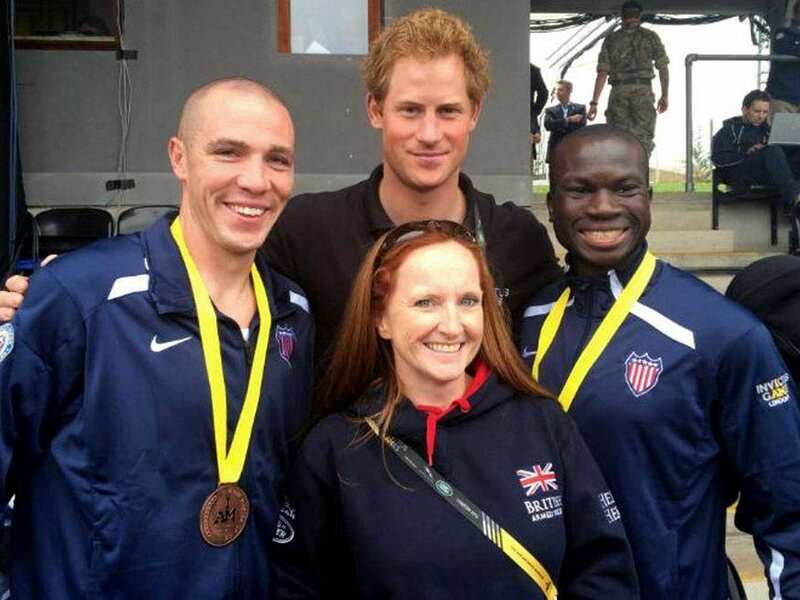 More than 500 athletes from 15 nations including Afghanistan, France and the United Kingdom, will compete at the Prince Harry-founded paralympic-style, multi-sport competition for service men and women (active duty and veterans) that first debuted in 2014. That’s the first quarter of English poet William Ernest Henley’s 16-line poem “Invictus,” which is Latin for “unconquered.” Henley, who penned the words in 1875, was stricken with tuberculosis at age 12 and forced to have his left leg amputated below the knee when the disease spread. Doctors didn’t amputate Reynolds’ leg immediately because, whenever possible, they try to preserve limbs of service members. During the first five weeks after the blast, Capt. Reynolds endured more than a dozen surgeries as doctors successfully restored blood flow to the leg using veins from his right leg. 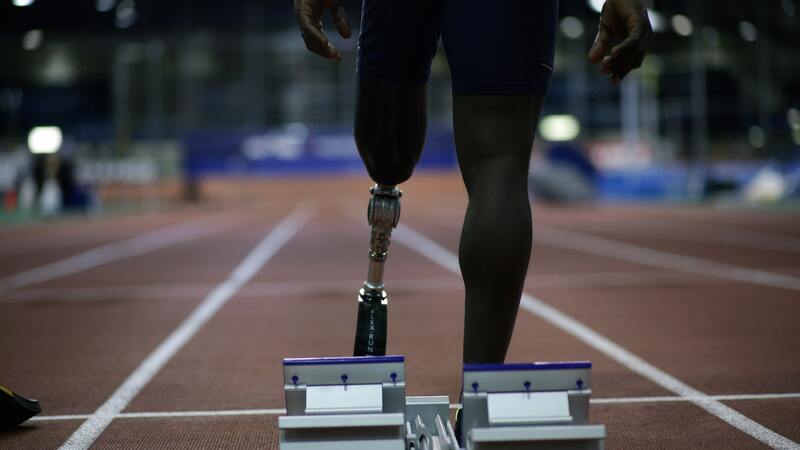 Doctors used rods and pins and screws to stabilize the leg, and he subsequently began limb salvage process at Walter Reed Medical Center, where they hoped his leg’s functionality could be restored. From the end of 2004 until 2013, Reynolds got around on his so-called pegleg. Figuratively, the injury didn’t slow him. He earned a Masters degree in public health and works in the private sector as a strategy and operations consultant in the military and veteran health realm. He and his wife Cassandra have been raising four children in Bethesda, Md. He competed in seated sports and remained as active as his body would allow. 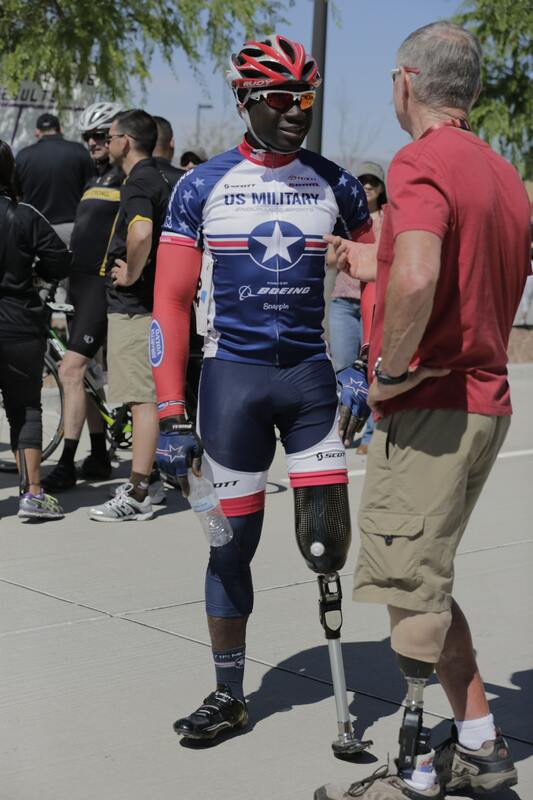 In 2012, Reynolds served as a volunteer at the U.S. Department of Defense-organized Warrior Games in Colorado Springs, Colorado. Prince Harry joined the British contingent there in 2013 when he was inspired to take the spirit of that event to an international scale with the Invictus Games. In September 2013, as a result of complications with the effort to salvage the limb, and to improve his quality of life, doctors amputated his leg at the knee. Eight months later, he was fitted with a running leg with a blade foot (aka cheetah foot) at the bottom. He started out jogging about a quarter mile, increasing segments from there. By September 2014 he was well enough to compete in sprinting and cycling events at the inaugural Invictus Games in London. And that’s how Reynolds believes wounded warriors can really benefit. Because the road to recovery is painful and long — two years at a minimum, Reynolds estimates, to roughly 10 years as it was in his case. Reynolds’ favorite sport is cycling. 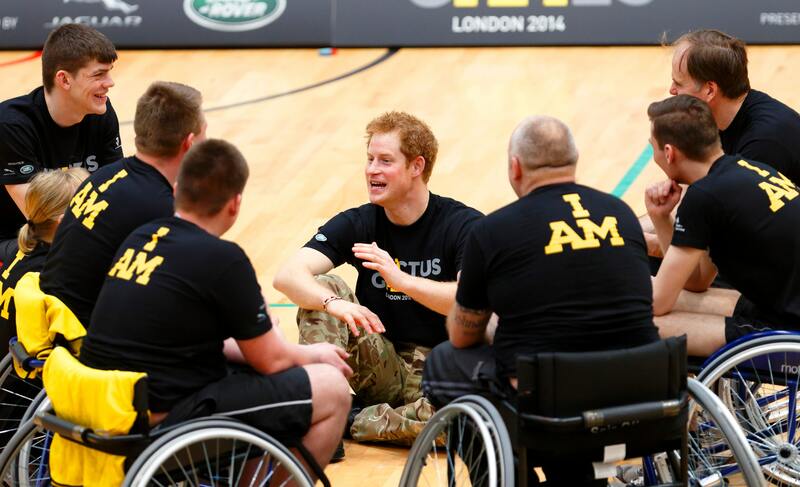 Other Invictus sports include powerlifting, sitting volleyball, swimming and wheelchair rugby. At the London games, Reynolds earned bronze medals in the timed trial and road race in cycling in addition to the pair of bronzes in the 100- and 200-meter sprints. This year he will compete in the 100-meter, 200-meter, 400-meter, 800-meter and 1,500-meter races for his Track & Field slate, as well as the road race and time trial cycling events. Reynolds, who trains anywhere between eight and 15 hours per week depending where he is in his season, was selected as a U.S. captain by a panel choosing between nominees from all the service branches. The U.S. co-captain is active duty Army Sergeant First Class Yancy Taylor. President George W. Bush will serve as the Invictus 2016 Honorary Chairman and Prince Harry will be in Orlando as well to support the 500-plus athletes of every flag. Reynolds says that all the competitors have been brought together not only by the sacrifice in military service but also the power, camaraderie and healing power of sports. And so the retired captain is a captain once again for the 115 U.S. competitors, their families, friends, and all the wounded warriors however many days or years into their recovery journey.